The three Amtrak California routes – Pacific Surfliner (green) San Joaquin (blue), and the Capitol Corridor (red). Other Amtrak routes in California are shown in black. Non-Amtrak commuter rail lines shown in yellow. Amtrak California ( reporting mark CDTX) is a brand name used by the California Department of Transportation (Caltrans) Division of Rail on three state-supported Amtrak rail routes within the US State of California, the Capitol Corridor, the Pacific Surfliner, and the San Joaquin. It also includes an extensive network of Thruway Motorcoach bus connections, operated by private companies under contract. The three lines shared the use of "Amtrak California" branded Thruway buses and trainsets. The National Railroad Passenger Corporation (Amtrak) assumed operation of almost all intercity passenger rail in the United States in 1971. Service in California, as in most of the United States, was basic and infrequent. In 1976 California began providing financial assistance to Amtrak. At the same time, Caltrans Division of Rail was formed to oversee state-financed rail operations and the brand Amtrak California started appearing on state-supported routes. In 1990, California passed Propositions 108 and 116, providing $3 billion for transportation projects ($5.8 billion after inflation), with a large portion going to rail service. As a result, new locomotives and passenger cars were purchased by the state, and existing inter-city routes expanded. A more distinct image for Amtrak California, such as painting locomotives and passenger cars in "California Color" of blue and yellow, was established with the arrival of new rolling stock. In 1998, while still funded by the state, the management of the Capitol Corridor was transferred to the Capitol Corridor Joint Powers Authority (CCJPA), formed by local jurisdictions of the line serves. In 2015 the management of the San Joaquin and the Pacific Surfliner were similarly transferred to the San Joaquin Joint Powers Authority (SJJPA) and the Los Angeles-San Diego-San Luis Obispo Rail Corridor Agency (LOSSAN), respectively. As a result, the "Amtrak California" brand became less prominent in the websites and marketing materials. Twenty-two additional locomotives built by Siemens will join Amtrak California's locomotive fleet starting from 2017. These locomotives, named Charger, were parts of a multi-state order funded by a combination of federal and state money. Illinois Department of Transportation, acting as the leading agency, awarded the order to Siemens on December 18, 2013. Caltrans ordered the first six with the initial order in 2013, then exercised the option to buy 14 more locomotives in 2015 to replace Amtrak-owned locomotives currently used on Pacific Surfliner. Two additional locomotives were ordered in 2016. Amtrak California's routes typically use bi-level, high-capacity passenger cars, dubbed the Surfliner and California Car. All of the California Cars are owned by the California Department of Transportation (Caltrans). Most of the Surfliner cars are owned by Amtrak with some owned by Caltrans. The design of the cars is based on Amtrak's Superliner bi-level passenger cars, but several changes were made to the design to make the car more suitable for corridor services with frequent stops. One very important difference is that the Surfliner and California Car have two sets of automatic doors on each side instead of only one manually operated door on the Superliners, which speeds up boarding and alighting considerably. Additionally, Surfliner and California Car coaches are equipped with higher-density seating and bicycle racks to permit transport of unboxed bicycles. As the leading agency of a joint purchase agreement with the Midwest Coalition consisted of Illinois, Michigan, and Missouri, Caltrans awarded the 130 bilevel passenger car order to Nippon Sharyo on November 6, 2012, to be built at Nippon Sharyo's new factory at Rochelle, Illinois, of which 42 would have gone to California  The design of new bilevel cars would have been based on existing California Cars with heavy involvement from Caltrans. However, Siemens was later selected to build new single level train cars after a car failed a compression test. Amtrak California utilizes a livery and logo that is different from the standard Amtrak colors. All state-contracted Thruway Motorcoach and state-owned locomotives and passenger cars, with the exception of equipment used on the Pacific Surfliner route, are painted in the "California Colors" of blue and yellow. Each permanently assigned passenger car is named after a geographical feature of California. The Capitol Corridor and San Joaquin trains are the two routes most identified with the Amtrak California image, since they extensively use "California Colored" equipment. The other state-supported rail route, the Pacific Surfliner, uses a unique blue and silver paint scheme that is different from the other Amtrak California-branded trains. The NPCUs that operate on the Capitol Corridor and San Joaquin are painted differently from the locomotives, as they are painted in the old Caltrain locomotive livery, with an Amtrak California and Caltrans logo on the sides. The single level cars, both the Comet cars and the Horizon dinettes, have three stripes closest to the boarding doors, orange, blue and green, which resemble the NJ Transit livery that was previously used on the Comet cars. The Pacific Surfliner is a major commuting route in Southern California. The entire length of the line runs from San Luis Obispo in the north, down to San Diego in the south. It hugs the California coast for most of the route–as close as 100 feet from the Pacific in some areas–providing a stunning backdrop. Most trains on the Pacific Surfliner route only travel a portion of the whole route. With 2.7 million passengers in fiscal year 2013, this is Amtrak's most heavily travelled service outside the Northeast Corridor. This is the busiest of the three Amtrak California routes in terms of ridership; in fact it is the third-busiest Amtrak route nationwide, behind only the Northeast Regional and the Acela Express. It is also the oldest; service along this route dates to 1939, with the Santa Fe's San Diegan. Amtrak extended up the Central Coast in the 1980s and 1990s, ultimately renaming it the Pacific Surfliner in 2000. The San Joaquin operates 14 trains (7 in each direction) each day between Bakersfield and Stockton. From Stockton, five trains from Bakersfield continue west to Oakland, while two trains proceed north to the state capital of Sacramento. Central Valley communities served include Fresno, Corcoran, Hanford, Lodi, Madera, Merced, Modesto, Turlock/ Denair and Wasco. Delta/ Bay communities of Antioch, Martinez, and Richmond are also served by the San Joaquin. Los Angeles is not served on this route due to the bottleneck of the Tehachapi Pass line, where the Union Pacific prohibits passenger train use due to freight traffic along the world's busiest single-track railway. (On rare occasions Amtrak trains use this as a detour if their railway tracks are being repaired.) The San Joaquin has operated since 1974. 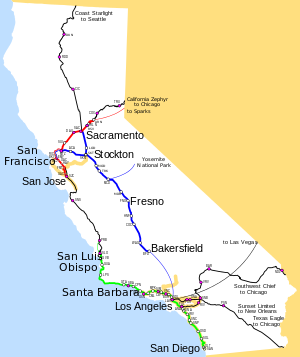 The Capitol Corridor route, operating since 1991, runs north from San Jose through the East Bay to Oakland and Richmond, then east through the Delta communities of Martinez and Suisun City, and the Sacramento Valley cities of Davis and Sacramento. One Capitol Corridor train per day continues east of Sacramento during the afternoon commute to the small Sierra Nevada town of Auburn, returning in the morning. It is the fourth-busiest Amtrak route nationwide. ^ a b "About Amtrak California". State of California Department of Transportation. 2013. Retrieved December 22, 2013. ^ Sheehan, Tim (June 26, 2015). "Valley agency takes control of Amtrak San Joaquin trains". Sacramento Bee. Retrieved November 15, 2016. ^ Tita, Bob (February 27, 2014). "Caterpillar Loses High-Speed Train Contract". The Wall Street Journal. Retrieved May 4, 2015. ^ John Palminteri (November 10, 2015). "Cleaner Train Engines Coming to the Central Coast". KEYT- KCOY- KKFX. ^ "Amtrak Sets Ridership Record And Moves The Nation's Economy Forward – America's Railroad helps communities grow and prosper" (PDF) (Press release). Amtrak. October 14, 2013. Retrieved September 3, 2014. ^ "State of California FY2017 Fact Sheet" (PDF). Amtrak. November 2017. Retrieved June 6, 2018.